This is the first novel for Power and I found her style to be more mature and polished than one would expect for a debut novel. The settings of the story were impeccably described and the main characters were fully developed. That being said, this book did not really work for me. There are two stories--one of Callie in 2000 and one of her mother, Clio, in 1940. While I found Clio's story fascinating, it clearly played second fiddle to Callie's tale. When it came to Callie's story, I never really figured out what it was truly about. Was it about Callie's mother issues? About her intimacy issues? About something else entirely? The reason for her story was never clear. I did not find Callie to be a likable character--and while that is not a deal breaker for me, she never really seemed to redeem myself in my eyes. I found her to be immature in general, inconsiderate in her relationships, and unnecessarily nosy when it came to her Mother's history. I understand that Callie's supposed need to know about her mother's past is the thread that supposedly holds the book together. However, I never figured out why it was so important. Instead, Callie just came across as someone who was determined to dig up painful memories for her mother in order to punish her. Mixed in with all this is an absurd story line of Callie wavering about her relationship with her fiance, Jonah, and a group of young greeks. Again, I was never clear what the point of this was. 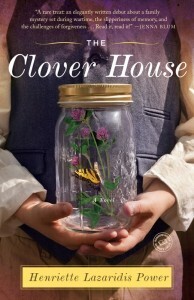 While I did enjoy Power's writing and the historical side of this book, it just was not enough to save The Clover House for me. Wednesday, April 24th: Peppermint Ph.D. This review is part of a book tour by TLC Book Tours. I received a copy of the book to read and review, but all opinions in this review are mine, and mine alone. I received no further compensation for this review. Is the Reading Challenge widget on your page from GoodReads? I have an account there but always forget to update it! Anyway, thanks for the review. I need to read more non-fiction. Darn, I'm sorry to see that this one didn't quite work for you, but thanks for being a part of the tour. I am reading this book for a review right now, and I have many of the same thoughts about it. Callie is just so stinking immature...I was shocked when she made reference to being 35, because she acts like a 21 year old. : ) Good to know it's not just me!